What would you spend to save your pet? More notes on debt management. Tempted as I was to give him a home, I didn’t cave. Well, I couldn’t. I’ve a dog in my family and I’m not at all sure how Daisy would react to a miniature piglet entering the home turf. Though Daisy is friendly towards humans and her own kind, I wondered would she perceive Patches as a strange interloper and in a fit of instinctive, territorial jealously take after the wee thing? Visions of a terrorized, squealing piglet entered my head and I immediately dismissed all fanciful notions about Patches joining the family. 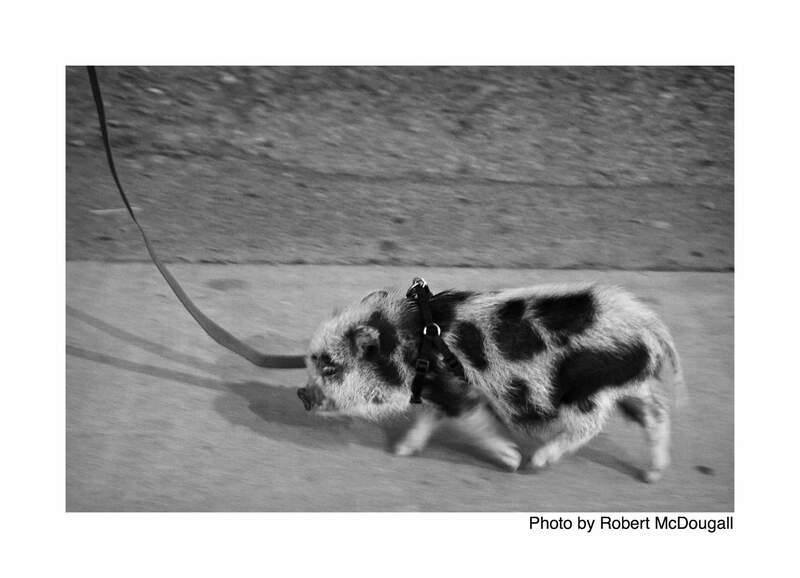 But it didn’t stop me from doing a little research about miniature piglets out of general curiosity. High maintenance and often highly temperamental, the creatures can be quite a handful, I learned. Most interesting to me as a credit counselling specialist were the costs associated with owning one of the animals. The spectre of debt management gone awry suddenly raised its less than cute head. • $150 for a sand pile, busy ball, and other “enrichment” items. • $100 annually for special lotions, medications as Patches ages ($400 annually if he’s arthritic). So it turns out that for ownership and basic care and maintenance, Patches would cost a pretty nickel from the day he’s purchased until the day he passes on some twenty years later. I calculate a piglet lifetime cost of somewhere around $35,000 provided Patches lives out his years in reasonably good health. Yes, dear reader, this is what the love of a pet – even the imagined love of a pet – can do to a person. And I’m hardly alone in my sentiments even if they fall only within the realm of speculation. Truth is, many pet owners of average income claim they’re willing to spend a lot to save their beloved animals. Surveys about the matter are limited across North America. But one Associated Press-Petside.com poll from not so long ago found that 22 per cent of pet owners said they would be willing to pay a medical bill of up to $5,000 to save their pet. That’s no small potatoes for many millions of families of average means. Indeed, in many if not most cases a sudden bill of this nature would add significantly to debt problems. Still, it’s one thing to imagine what one might spend on a pet in peril, and quite another to actually deal with the emergency. I throw the challenge out to anyone who owns a pet. Take a quiet moment to sit with your beloved friend and look into his or her eyes. Ask yourself what you would do if suddenly the animal required emergency medical attention that might cost you plenty but that would certainly save your pet’s life. What would you be willing to spend? Try to be honest – and realistic. You might have to imagine summoning courage. In the meantime, maybe think about gradually building a rainy day fund not just for family emergencies, but for furry ones too.